Jack Dunn did his best Robbie Fowler impression on Wednesday night to notch a quick-fire hat-trick as Liverpool U23s beat Bangor City 6-0. Dunn’s trio of goals came within eight minutes of each other and all inside the final 15 minutes of the match, after he had entered the action as a half-time sub. Liverpool players have a proud history of scoring rapid hat-tricks. 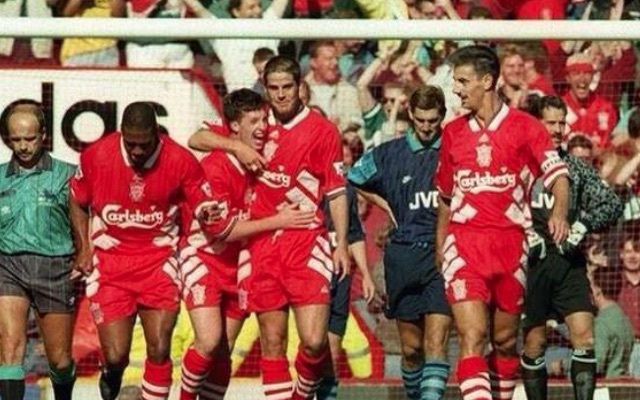 Fowler’s famous Anfield triple against Arsenal in 1994 took just four minutes and 32 seconds. It was a Premier League record until Reds star Sadio Mane put three past Aston Villa in two minutes and 56 seconds while playing for former club Southampton in May 2015. Dunn’s hat-trick won’t last as long in the memory as either of those, having come in front of a modest crowd of 2,000 fans at the Bangor University Stadium. However, it was an impressive feat nonetheless – and not his first hat-trick of the season. Dunn came off the bench to bag three times for Morecambe in a 5-4 EFL Cup win over Rotherham United back in August. Toni Gomes also found the net against Bangor, while Harry Wilson bagged a brace. Despite Liverpool spending most of the night on the attack, many eyes were firmly fixed on 19-year-old centre-back Cian Harries. Teenager Harries, who is currently on the books of Coventry City, was named on the teamsheet as a trialist. With Liverpool thoroughly dominant, Harries wasn’t overly tested in a defensive capacity, spending most of his Reds debut confidently knocking passes around from his base near the halfway line. Harries, who is known as a ball-playing centre-back, has made 15 first-team appearances for Coventry to date.